Brethren, on the 3rd December last year, some of us were privileged to attend the Installation meeting of St John and St Paul Lodge No 349 in Malta. It was a rather unique meeting in that W Bro Justin Tonna the WM (first time) installed Bro Norman Tonna (his father) into the Chair of King Solomon – a very rare occurrence, I believe. It was a great evening and we were made most welcome, and by the number of young masons in the Lodge; Freemasonry is thriving in Malta. On the Saturday preceding this meeting, W Bro Nigel and I, accompanied by our wives, Jennifer and Penny, were given a guided tour of the English Masonic Hall by the VW Bro Dr Lawrence (Larry) Porter, Grand Inspector, which was a fascinating insight into Freemasonry in Malta. During this visit we were shown the life size portrait of Waller Rodwell Wright, which sits in the lodge dining room and also a smaller copy newly commissioned which is situated in the smaller 2nd Lodge room. WALLER RODWELL WRIGHT also played an important part in the greatest Masonic transaction of all time, for his name appears as one of the five signatories (immediately following that of the Duke of Sussex) in the Articles of the Union of the two Grand Lodges – the Moderns and the Antients, to form the United Grand Lodge of England, the signing taking place at Kensington Palace on the 1st December 1813. 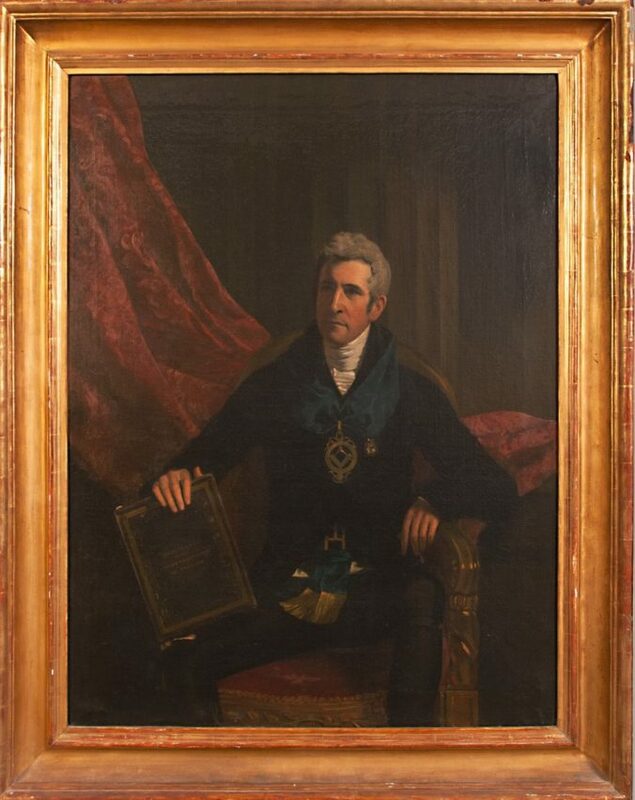 The painting, (attributed to Allingham) was commissioned to mark the foundation of the Lodge of St. John and St. Paul in 1818, and WALLER RODWELL WRIGHT is seen wearing the collar of the Provincial Grand Master and the distinctive jewel of the Prince of Wales Lodge. He is depicted holding a folio copy of the Book of Constitutions. 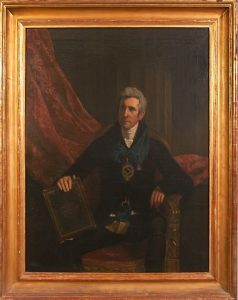 On seeing the copy of the painting, Penny and I wondered if it would be possible to get a copy produced for our Lodge, so that the “Great Man” could watch over us and with the help of the Grand Inspector, VW Bro Dr Lawrence (Larry) Porter this has been possible. W Bro Nigel, it is with great pleasure that Penny and I present this copy of the portrait of WALLER RODWELL WRIGHT, in memory of my late father W Bro Arthur Perry, (a former Master of this Lodge) to the Lodge and hope you will accept it for future generations of Masons to see.